Application Notes: Detects bands of ~28kDa by Western blot. Scientific Background: Researchers cloned DJ-1 protein, consisting of 189 amino acids, from a HeLa cell cDNA library as a oncogene which weakly transformed NIH3T3 cells. Cotransfection with ras or c-myc enhances transformation by DJ-11. DJ-1 expression is induced by growth signals, and it is translocated from the cytoplasm to the nucleus during the S phase without the presence of any nuclear localization signals. In addition to its potential involvement in ras-mediated signal transduction pathways, DJ-1 is known to regulate transcription of androgen-responsive genes, and is sensitive to oxidative stress. DJ-1 is ubiquitously expressed in various human tissues including the brain, with high expression in astrocytes of the frontal cortex and substantia nigra. Homozygous mutations in the DJ-1 gene have been shown to cause early-onset autosomal recessive Parkinson’s disease. 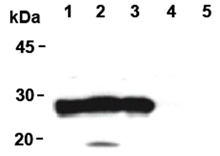 Western blot analysis of Jurkat (1), Raji (2), HeLa (3), NIH/3T3 (4) and PC12 (5) using DJ-1 mAb (3E8).